The Delhi Metro, under the stewardship of E. Sreedharan, has created a system that is a technological marvel as well as an example of successful corporate culture. Besides other states of India, many foreign countries too want to replicate the experiment. Ramesh Ramachandran scans the metroscape. The quest for excellence comes naturally to Elattuvalapil Sreedharan. In school, he would vie with T.N. Seshan to come first in class. Today, the 73-year-old managing director of Delhi Metro Rail Corporation has set a scorching pace for his co-workers to follow. That competitive streak in him has motivated the 1,650-strong workforce to avoid delay or cost-overrun and to transform the Delhi Metro into a technological marvel. Sample this. The Metro conducts over 250 to-and-fro trips per day along the four-km underground stretch between the Delhi University and Kashmere Gate stations. There is a train every six minutes during peak hours from eight in the morning to eight at night and a train every 10 minutes in lean hours – 6 to 8 am and 8 to 10 pm. 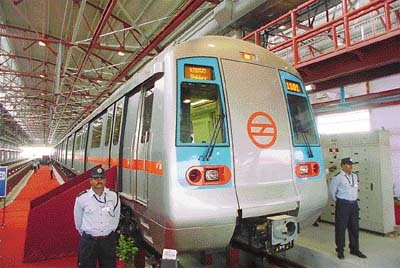 The DMRC hopes to increase the frequency of trains gradually. The Kashmere Gate – Delhi University section, slated for completion in June this year, was completed seven months ahead of schedule and is expected to attract 20,000 commuters per day. 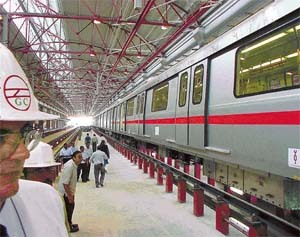 The Metro is also operating trains between Shahdara in East Delhi and Rithala in the West on an elevated track. There are 18 stations on the 22.8-km stretch between Shahdara and Rithala. Prime Minister Manmohan Singh inaugurated the underground section on December 19. Appreciating the efforts of the DMRC, he observed, "The time has come for all of us to think big and think into the future. The 21st century will be the Century of Asia and without doubt the Century of India but to hasten this journey, we have to create the required social and economic infrastructure." And think big, Sreedharan certainly did. The phase I is expected to generate substantial benefits. Not only would it bring down the number of buses on the roads by 2,600, it would increase the average speed of buses from 0.5 km per hour to 14 km per hour. Two million man-hours per day would be saved due to reduction in journey time. Fuel cost worth Rs 5 billion per year would also be saved. "Over the next two years," Sreedharan has said, "the other sections of Phase I would be thrown open for commuters. The Kashmere Gate – Central Secretariat corridor would become operational by June and the Barakhamba-Dwarka corridor in December. The Barakhamba-Indraprastha corridor is scheduled for completion in March 2006 by when 15 lakh passengers would commute daily." Executing a project of such a mammoth proportion did not come without its share of challenges. A team had to be chosen, contracts had to be signed and tenders placed, deadlines had to be set and met, traffic needed to be regulated and finances managed `85 and all this without causing an iota of inconvenience to the forever-cribbing Delhiite behind the wheels, who is perpetually in a hurry and can do without road rage. "We had an able and experienced team leader in Sreedharan. He spelt out the mission statement and the corporate culture clearly to one and all. The idea was to make Delhi Metro a world class Metro, a vehicle to promote dignity and discipline in the city," recalled the chief public relations officer of the DMRC, Anuj Dayal. 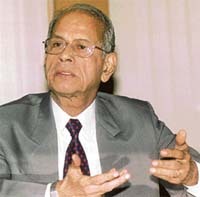 "Sreedharan’s personality also was a crucial factor. He led by example." The "corporate culture" accordingly lays out that integrity of executives and staff should be beyond doubt; punctuality is the key word; targets are most sacrosanct; organisation must be lean but effective; corporation must project an image of efficiency, transparency, courtesy and "we-mean-business" attitude; and construction should not lead to ecological or environmental degradation. What contributed in no small measure to DMRC’s success was the autonomy given to the managing director. "Sreedharan took up this task on the condition that he should be allowed to choose his own team. Furthermore, he came to enjoy a fair degree of autonomy. Financial powers were vested in the managing director. Also, the managing director was the last authority on tenders," explained Dayal. Another precondition was the minimum interference of the government. The work culture was so designed as to reduce dependence on subsidies. Soon the message went down the line that there is nothing called a free lunch or freebies. The organisation therefore was able to resist pressures from many quarters. Even the Prime Minister bought a ticket for enjoying a ride on the Metro. The success of this venture would not have been possible without divine intervention. Any other project of this magnitude might have got bogged down in litigations, but not so with the DMRC. Although there are about 400 cases pending in various courts, no stay order has been given till date. That meant the DMRC could go about executing its works without worrying too much about cost escalation or project delay. In the past six years, the DMRC has also redefined public relations to a certain extent. It did not employ conventional methods, though. Instead, it chose alternate ways to generate goodwill for the organisation. Fortunately, it did not need to look far. In ensuring minimum inconvenience to motorists and pedestrians alike, the DMRC successfully converted a challenge into an opportunity. That paid dividends too. All utilities were diverted in advance to ensure that there was no disruption of water, electricity, sewerage and telephone connections during the construction of the area. Barricades were put up. An alternate traffic plan was drawn up with the help of the Indian Institute of Technology, Delhi, and in collaboration with Delhi Police. Also, new roads were built or the existing roads widened to accommodate traffic. The DMRC organised community interaction programmes for redressing problems that arose among the local people. Every Monday, heads of department would meet and set new or review targets. "We have also devised a reverse clock," says Dayal. When The Tribune caught up with him, the clock showed 128 days to go for completion of the underground stretch of corridor between Kashmere Gate and Central Secretariat. For an organisation that has earned the distinction of being efficient and has a Managing Director in Sreedharan, who is the proud recipient of Padma Shri and was chosen the Asia Man of the Year by Time magazine, the bottomline remains as significant as ever. Although a little more than a year into operation, the DMRC is recovering the operational cost and ploughing back the surplus into repaying the loans. Not only does Delhi Metro offer a more comfortable and safe travel for the commuters, it would help reduce atmospheric pollution levels by 50 per cent. Commending the DMRC for paying due attention to environmental concerns, the Lieutenant-Governor of Delhi, B.L. Joshi, recently said, "The construction had been undertaken in an eco-friendly manner and 10 trees had been planted for each one felled." The DMRC has also secured ISO 14001 certification for adhering to environment protection norms and the OSHSAS 18001 certification for meeting world standards in protecting the health of workers and passengers alike. Another hallmark of its operations has been labour standards. It employs 45 persons per kilometre of work. This ratio is one-third of that of the organisations elsewhere in the country. The Delhi Metro comes equipped with several unique features. The ticketing system is fully automatic. Passengers have the option of using contact-less smart cards and contact-less tokens. Unlike the tokens, smart cards can be used for multiple journeys. Parking facilities are available at Metro stations for private vehicle owners who can park and ride on the Metro. Special feeder buses are also provided. The world’s most sophisticated and advanced safety measures have been implemented in all Metro stations and trains. In the unlikely event of an emergency, the system is geared to evacuate all passengers within 5.5 minutes from elevated stations and four minutes from underground stations. The control centre ensures that if a train breaks down, other trains will automatically stop at a safe distance away, to avert collision. The Chief Minister of Delhi, Sheila Dikshit, who has monitored the progress of the project all along, is relieved. 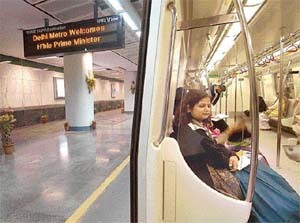 Not only did the introduction of the Metro enable her to win an unprecedented second term in office having caught, as it did, the fancy of the voters, it has also given a modern look and character to the city that otherwise lacked an efficient public transport in keeping with its status as the country’s Capital. She acknowledges that the Metro would reduce congestion on roads and also bring down the level of pollution in the city. "We have learnt a lot from the DMRC, its work ethics and decision-making process," she observed. Incidentally, Delhi Government appoints the managing director of the DMRC. The Union Government, which is an equal partner in DMRC, nominates the chairman. Meanwhile, the Delhi Metro continues to attract visitors from far and wide. They all have come, seen and concurred that it is comparable with, if not better than, the best in the world. "The Delhi Metro visit was a highlight of a captivating and enjoyable India tour," wrote the assistant private secretary to His Royal Highness The Prince of Wales, who was presented a commemorative framed plaque and a book as a souvenir. The Prime Minister, Dr Manmohan Singh and his wife, Gursharan Kaur, turned nostalgic after their ride on the Metro. "As a member of a faculty of Delhi University, I commuted by public transport to work. At that time Delhi was not as big and crowded... it was easier for me and my family to commute by public transport," Singh said, recalling the days he used to travel by bus to the Delhi University. The trend set by the DMRC has found takers in several states that want to replicate the Delhi Metro model. The DMRC has already prepared detailed project reports for Bangalore and Hyderabad. The governments of Maharashtra, Tamil Nadu and Gujarat also have approached the DMRC with similar proposals. The governments of Sri Lanka, Syria and Pakistan also have shown interest in DMRC. After inaugurating the first underground section of the Delhi Metro last month, Prime Minister Manmohan Singh observed, "Urban public transport is a national priority. Our government proposes to launch a National Urban Renewal Mission and we will ensure that public transport and public amenities for the people, particularly the weaker sections, receive special attention in this plan. Pointing out that he was impressed by the quality of infrastructure built by the DMRC, the Prime Minister had also said that other cities should learn from the experience and example of the DMRC. "We hope we can replicate this model elsewhere," he had stated but a crucial question remains unanswered: Is Metro the panacea for the burgeoning metropolises faced with a nightmare that urban public transport is? Opinions differ what with alternate modes of transport engaging the attention of policy makers and commoners alike. The options available range from sky bus, electric trolley and high capacity bus system to rail and tram. Ideally, a mass rapid transport system should be one that makes use of the existing roads but does not take up road space, integrates various modes of transport and is cheap, reliable and safe. Suburban railway may be Mumbai’s lifeline and the Metro might have the potential to change the way Delhi moves but certain policy makers insist that in order to strike the right balance among various modes of transport, an extensive mass rapid transport system is required, especially one that integrates the Metro, rail, bus, etc to provide safe, eco-friendly, cost-effective and efficient transportation. The population of Delhi, for instance, is expected to grow (from 138 lakh in 2001) to 230 lakh by 2021. However, the daily transport demand is expected to grow (from 139 lakh in 2001) to 279 lakh passenger trips by 2021. To cater to this demand, the mass transport system would need to be augmented substantially and the road infrastructure, traffic management and associated amenities improved substantively. The Transport Policy of the Delhi Government acknowledges that there are several factors responsible for the prevailing road congestion, pollution and lack of road safety. "The basic cause, however, is the imbalance in the modal mix of passenger traffic carried by various modes of transport. There is a preponderance of low-capacity vehicles such as two-wheelers and cars," reads the policy document. The policy focuses on increasing mass transport options by providing adequate, accessible and affordable modes like buses, mini-buses and electric trolley buses complemented by a network of rail-based mass rapid transit systems like metro and commuter rail. Para transit modes like autos and taxis as also cycles and cycle rickshaws are envisaged to provide feeder services in designated areas. There are others who point out that lots of cities in Europe and the US have already got much better public transport than Delhi but that does not stop more and more people wanting to use their own cars. They suggest that any transport plan should not only improve the public transport but also discourage private vehicles. Incidentally, Delhi has more numbers of vehicles than all the other three metros put together.